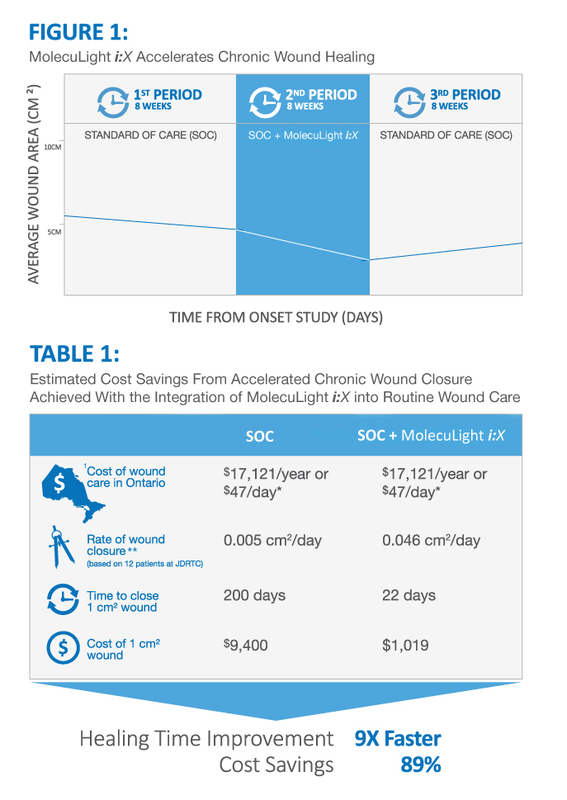 A study to measure wound area and evaluate the rate of wound closure was conducted at the Judy Dan Research and Treatment Centre in Toronto, Canada. Patients with lower-extremity chronic wounds were assessed and treated over three time periods, initially for eight weeks with the Standard of Care (SOC), then eight weeks of the SOC combined with the MolecuLight i:X™ Wound Imaging Device, followed by eight weeks of the SOC. 1. Wu, YC. Clinical evaluation of a hand-held fluorescence- imaging device for real-time wound care monitoring. Unpublished MHSc thesis, IBBME, University of Toronto. 2013. **Calculations based on a 1 cm diameter chronic wound.